Several years ago I sat entranced watching Mark Bittman make pasta from scratch on his New York Times video column. I had no idea you could just up and make pasta. As far as I was concerned, pasta only came dried into sticks in a box. Mind -> blown. That’s it! So easy, eh? Then you just boil your noodles for 1-2 minutes and choose your toppings and sauce. I kept mine simple with basil pesto and parmesan cheese. You could also go a more fancy, pumpkin-themed route with my recipe for Spicy Pumpkin Mac ‘n’ Cheese, which can be found in our 1 Cup Water e-Book. Another perk of this recipe? You don’t need a pasta maker or crank. If you have a trusty rolling pin and a pizza cutter or knife, you’re in business. Look at those fresh, fluffy noodles. 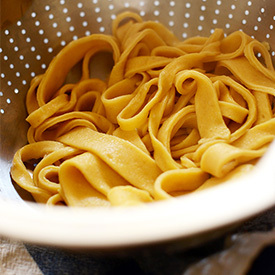 Nothing like fresh pasta, according to Mr. Bittman. I 100% agree. If you aren’t a big pumpkin fan, don’t fret as the flavor isn’t that prominent – it’s more of a hint and way to add some color. 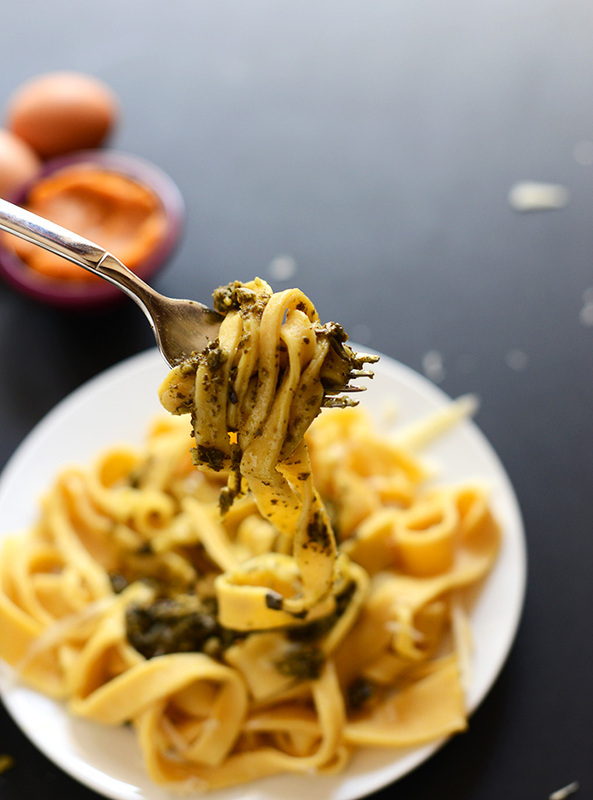 You could also sub pesto for the pumpkin for a super flavorful pasta, or just omit it altogether and add in one more yolk and one more whole egg as the original recipe suggests. I loved this pasta with pesto. We also tried it with tomato sauce and it was just as tasty. Though I didn’t try it with my pumpkin cheese sauce, I’m sure it would be dreamy. Enjoy! 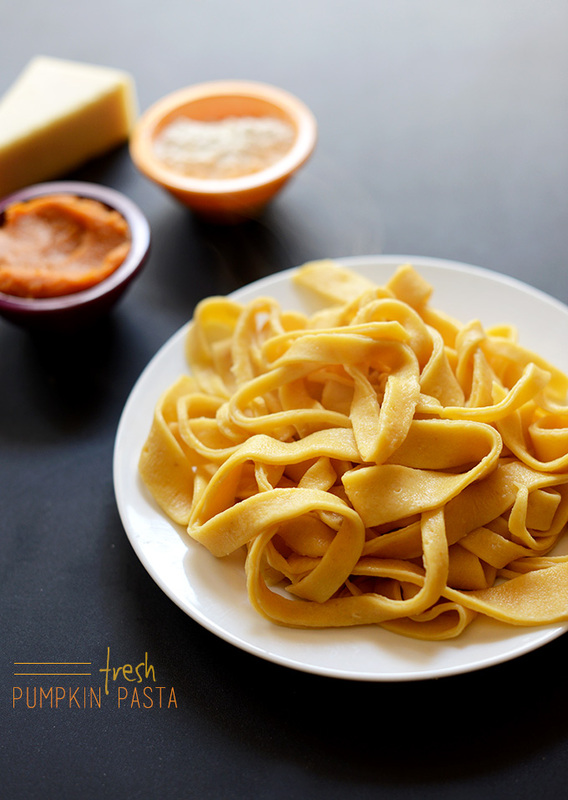 5-Ingredient pumpkin pasta from scratch, no fancy techniques or pasta maker required! Add flour and salt to a food processor and pulse. 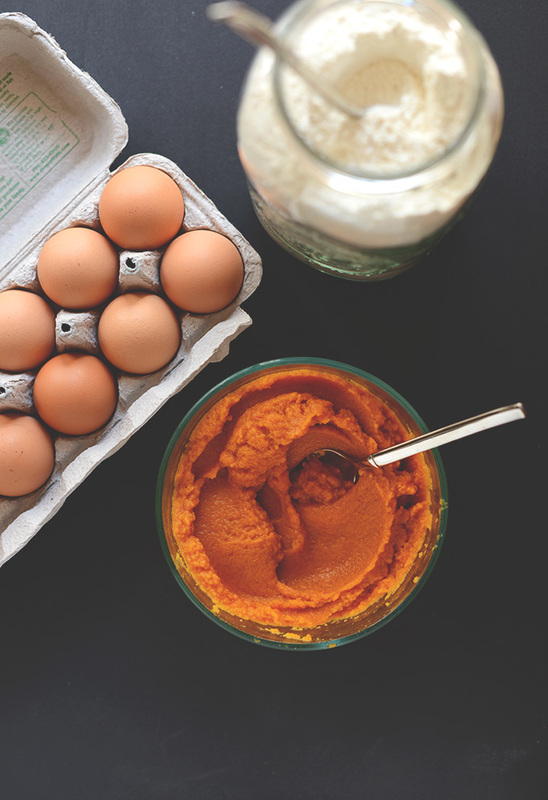 Then add in whole egg, egg yolks, and pumpkin puree. Pulse until well combined. Then drizzle in water until a dough forms (see picture). Transfer to a very lightly floured surface, sprinkle top with a little flour, and cover with plastic wrap. Set aside for 30 minutes to rest. After it’s rested, bring a large pot of water to a boil and salt generously. Cut the pasta into thirds and begin rolling out into a loose rectangle, sprinkling on only as much flour as it takes to keep it from sticking. More flour = a less flavorful, tender pasta. Also, the pasta will want to stick to the rolling pin – simply use one hand to hold it down while you use the other to roll. Once the dough is nearly paper thin, cut it into any shape you want. You can even leave it in a solid sheet if you’d like. I used a pizza cutter to cut mine into fettuccini-sized strips. Cover with plastic wrap until ready to cook. Add pasta to boiling water and stir just to make sure they don’t stick together. It should only take 1-2 minutes to cook. Drain and transfer to serving plate. Top with pesto and parmesan cheese, toss with your favorite tomato sauce, or try this easy pumpkin mac-n-cheese sauce. *Heavily adapted from Mark Bittman (see his recipe for video instructions). *Nutrition information is a rough estimate calculated without sauce or other toppings. This recipe is so delicious! Also, a great way to get kids cooking in the kitchen – they think it is so fun to make pasta! As a total winner, I included this recipe in a round-up of favorite vegetarian dinner ideas. Thanks for creating such amazing recipes, can’t wait to try more! 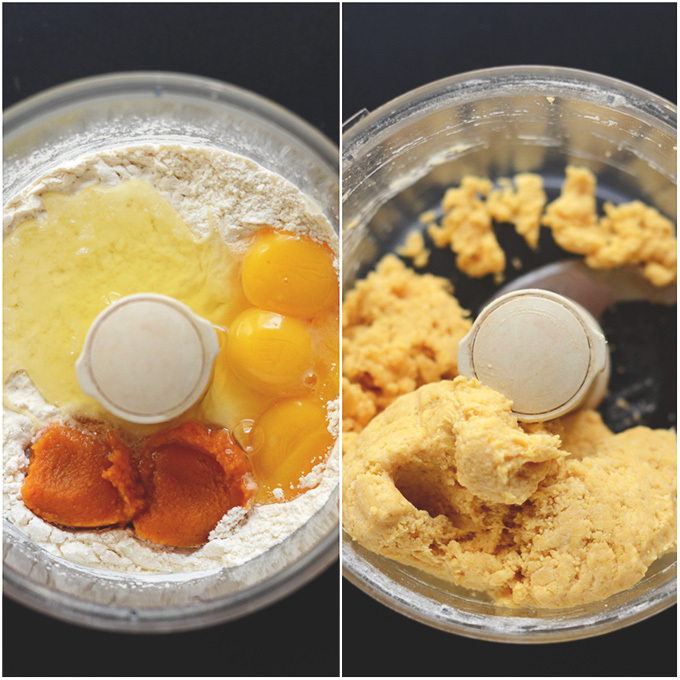 Recipe modification: 2 cups flour, 1/4 tsp salt, 3 rounded Tbs pumpkin, 1 whole egg, 3 yolks. Followed food processor instructions to combine thoroughly. Transfered mixture to bowl and pressed into a dough ball. Added very minimal water to outside and let it rest. Divided dough in thirds and used pasta roller/cutter. Best pasta I’ve made. Served with ribbons of shiitake mushrooms cooked in garlic butter and a small amount of peppery hot tomato sauce. Thanks for sharing your recipe modifications, Emily! Hi Sonam! 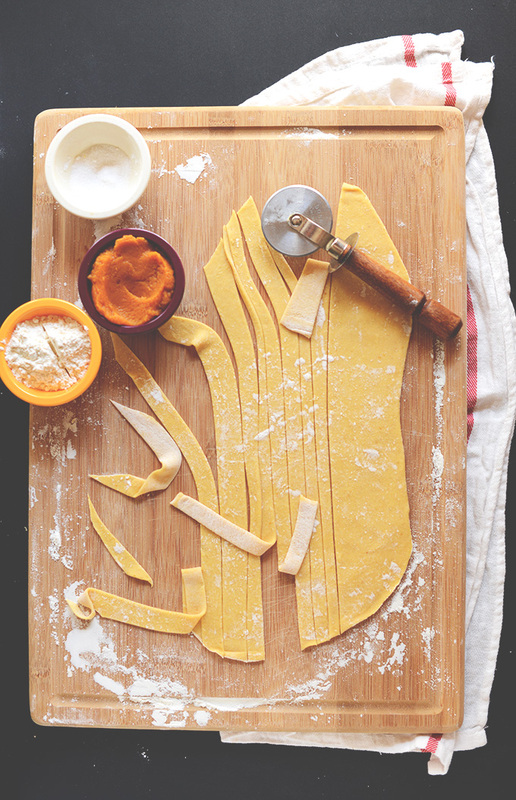 Find a similar version here, and a sweet potato eggless ravioli in our cookbook! Hi there, I am wondering if there is a way to make the pumpkin pasta gluten free? So instead of using the unbleached white flour, is there another flour I could use? Hi Dana, would it be possible to use a flax egg for this recipe or am i better adding more pumpkin puree and flour? I have been vegan for the past two years now and Dana I have to say I absolutely LOVE all of your recipes I have tried (there are a lot). Eating plant based meals means you need to pay special attention to all your ingredients and seasonings. You are spot on! My husband and I had fun making your homemade vegan pasta recipe. How simple (just a bit messy) and delicious. My question is, can I just add the pumpkin purée to the vegan pasta recipe? I believe I could and just perhaps reduce the amount of water I use. Please advise. Thanks for helping make our healthier lifestyle more flavorful! 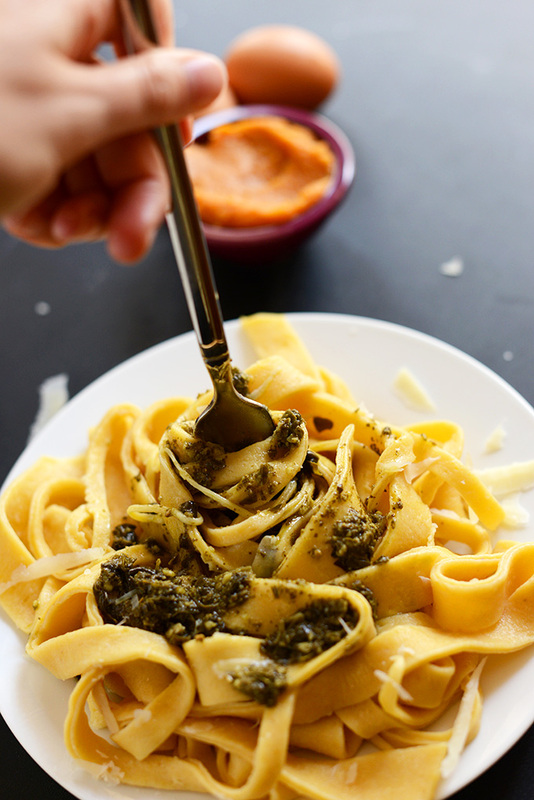 looking for the pesto part of this recipe, couldn’t find it? My food processor’s motor died recently (may it rest in piece) how would you suggest blending together the ingredients? A whisk and spatula, a knead hook, cutting it together with a butterknife? Hi! A spatula should work but will take longer than it would with using a food processor. Good luck! Substitutions: I made a gluten free version with Bob’s 1 to 1 gluten free flour substitution. I also used 4.5tbs of pumpkin and omitted the water. The result wasn’t overpowering in pumpkin flavor and utterly delicious. Note: I found it difficult to roll it very thin but the outcome was pillowy and delicious!! I didn’t have cheese so I dressed it in butter, salt and pepper. I saw a recipe on A Cup of Jo for pumpkin pasta with just pumpkin and flour. I’m glad I put eggs and salt in here, the pasta “grew” nicely. Made this today and it was super easy and good! Next time I will add some pumpkin pie spice for a little more pumpkin flavor! Love your recipes! This looks great. Could I make this into a ravioli? I would think so! If you do, be sure to take pictures and share it with us! I was wondering if this pasta could be dried out and packaged for gifts? Can you make the pumpkin pasta without the eggs? Find a similar version here, and a sweet potato eggless ravioli in our cookbook! Hi! Is there any way to make this vegan? Should I just replace the eggs with more pumpkin puree and flour? Thanks! That should work! It will affect the texture, but if you’re using semolina flour, you should be good! Looks and sounds delicious! I’ve been on a search for pumpkin recipes that aren’t pie or cookies or anything sweet and this fits the bill. Does the puree of pumpkin need to be cooked before making the pasta? Want to try this recipe it is very simple and easy. Like it! Can you elaborate? How should the pumpkin puree be cooked beforehand? What if you are using pumpkin from a can? Also, I want to make this, but I am single and only making food for myself! How do you store something like homemade noodles? That’s what I used! Canned pumpkin puree. 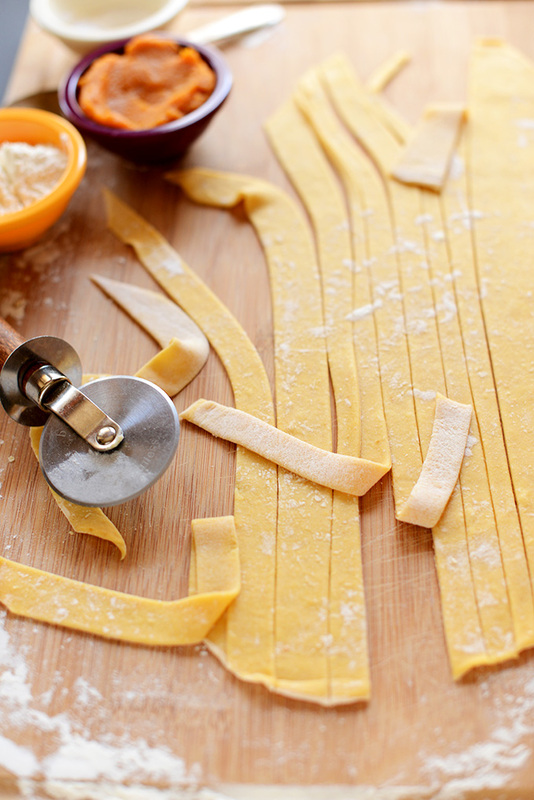 You can store homemade noodles tossed in a little flour to prevent sticking, covered in the fridge up to 3-4 days. Awesome! So how do I cook the puree before using it for the noodles? Canned pumpkin puree is already cooked…it’s basically roasted, pureed pumpkin flesh (thus you could also do it yourself). I had made this recipe two (? three?) years ago over and over because I loved it so much, but in between my Firefox profile died and I couldn’t save all bookmarks, since then I have been searching for this recipe whenever I craved butternut pasta (as I’ve always made it with butternut), and now I’ve finally found it again! So looking forward to making this again! This recipe looks great! Is there a ratio to make this recipe with MORE pumpkin flavor? Can you make a gluten free version? I’d love that. I made a gluten free version! It’s harder to roll very thin so you get these wonderfully thick(er) noodles (they grow when boiled). This looks AMAZING! If I could make it this very moment I so would! Do you think its possible to sub some of the all purpose flour for almond flour? This looks wonderful, I am embarrassed to say I’ve never made my own pasta but this may change that!! Yay! Isn’t it awesome? I love that the pumpkin infusion is slight, and the texture is so luxurious! Glad you are enjoying this, Brie! It was my first time making pasta. It was a great way to start!!! soooo good! This looks amazing! Any suggestions for egg and flour (gluten free) substitutes? I’m also wondering if you can just substitute a gluten-free flour for the wheat version? Heidi it’s worth a try but I don’t think it would work as well as regular flour. I would use a GF flour blend if you were going to try it. See this video for a point of reference/more help. You can make a gluten free version! I used Bob’s Red Mill 1-1 gluten free flour. It’s harder to get very thin due to the lack in gluten, but you get these deliciously thick noodles. Love this! You can put literally any pureed veggie in there and make incredible pasta. Spinach (blanch or steam then blend) and beet (roast or boil then blend) are my fave because a) tasty wut wut! and b) such gorgeous colours. I’m not sure if you made the noodle uneven in size on purpose but if you do want to make them more uniform in both width and straightness, it’s super easy. Just flour both sides of the dough then roll it up super loosely like a cigar or a cake roll. Then make your cuts and unravel the noodles! It’s probably a bit more time consuming but creates more even, straighter strands. Great advice! Thanks for sharing, Paige. wow! what an amazing fall recipe! i can’t wait to try this one out next week!! 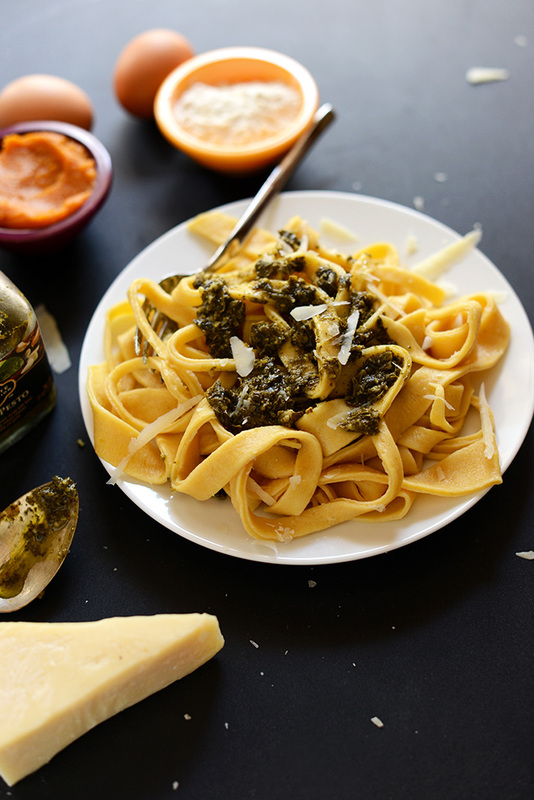 i love the idea of pairing the pasta with a pesto. mmm!!! 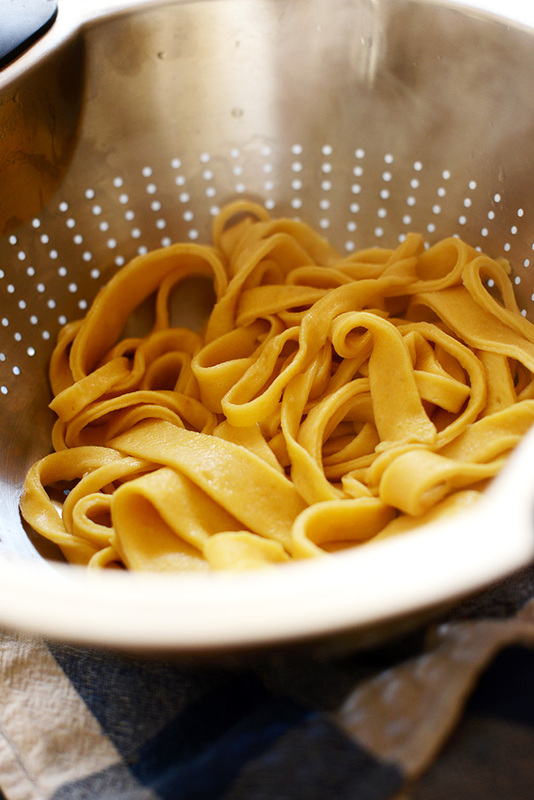 Gorgeous – I love making fresh pasta. Can’t get enough of it. I’m in love with the fact that I don’t need one of those pasta roller thingamajigs for this. Nothing beats homemade pasta. I love making it came fall and making pumpkin ravioli! This look so good and your photos are so pretty. Love it! Wow, pumpkin pasta sounds AWESOME. You guys… I can’t get over your recipes. They are just perfect. Every. Last. One. I’ve made pasta before with a pasta crank but it was a bit of a complicated process. Nice to know that’s not even needed and I can do it myself at home. Love it! this is on my list to do – thanks for the pumpkin version. I want to try this- looks so good! Do you know if there’s an egg substitute that I could try instead of eggs? This pasta is absolutely beautiful. I’m sure it tastes even better! Seriously gorgeous photography Dana! I love this! This is TOTALLY something I would have thought I’d never make at home. Unless maybe when I’m retired some day and in my sixties…BUT you’ve totally inspired me. I WILL do it and soon! Wow this looks to die for. 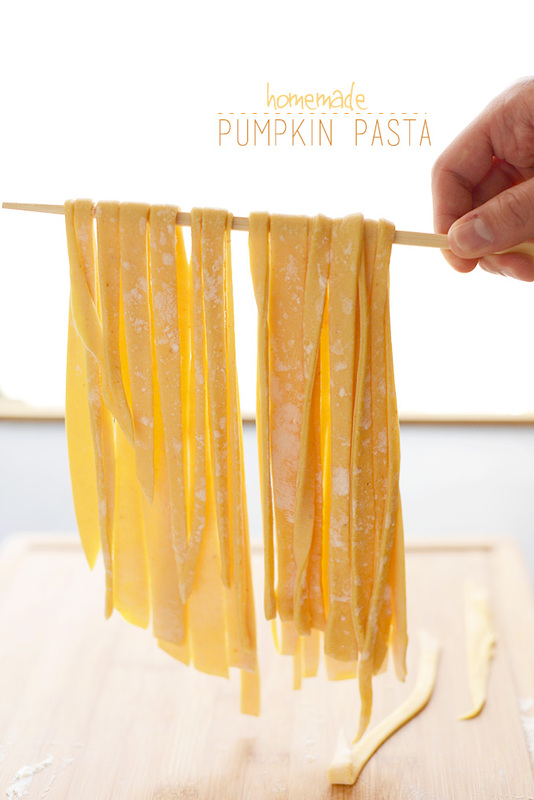 I have some left over pumpkin puree from when I made pumpkin risotto, so I might even just make this fresh pasta with it. Thanks for sharing! I love making home made pastas, it’s such a therapeutic thing. I saw this on pinterest and loved your pictures and your new layout looks really nice. Yum! Do you think it would affect the texture of the pasta if I used a blend of whole wheat and all purpose flour? Actually I think it would work quite nicely if you did so! I might recommend keeping it heavier on the all purpose for texture purposes though. Hope that helps! Thanks for your quick reply! I think I will be adding this to next week’s menu plan…may have to let my boyfriend fend for himself, since he’s a weirdo and doesn’t like pumpkin! I may need to bust out my pasta rollers for this. I’ve never made flavored pasta before, just stuffed! 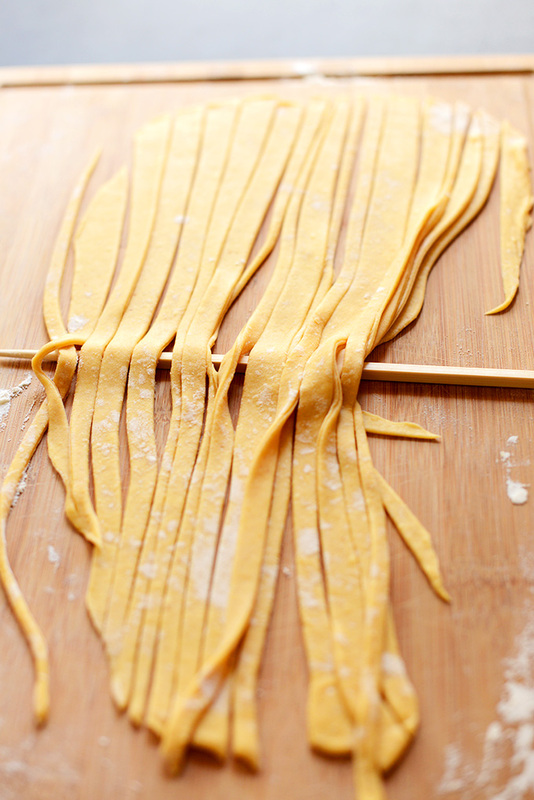 we love making hand made pasta! the taste is something completely different from store bought pasta – can’t compare it at all! I have never tried Pumpkin but it’s on my list now – thanks for the great recipe! It’s hard to find recipes where I actually have all the ingredients around the house – definitely trying this one soon! I had no idea that making your own pasta was so easy. I can’ t wait to try it. The new site looks great, guys!! I love how simple it is…it totally suits you. ALSO, this pasta is the shiz. Yum!